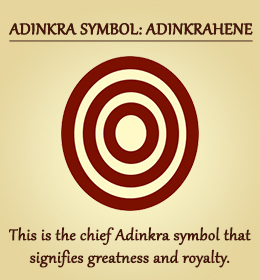 ADINKRAHENE “Chief of the adinkra symbols” – symbol of greatness, charisma and leadership. This symbol is said to have played an inspiring role in the designing of other symbols. it signifies the importance of playing a leadership role. AKOBEN “war horn” – symbol of vigilance and wariness Akoben is a horn used to sound a battle cry. AKOFENA “sword of war ” – symbol of courage, valor, and heroism. The crossed swords were a popular motif in the heraldic shields of many former Akan states. The swords can also represent legitimate state authority. 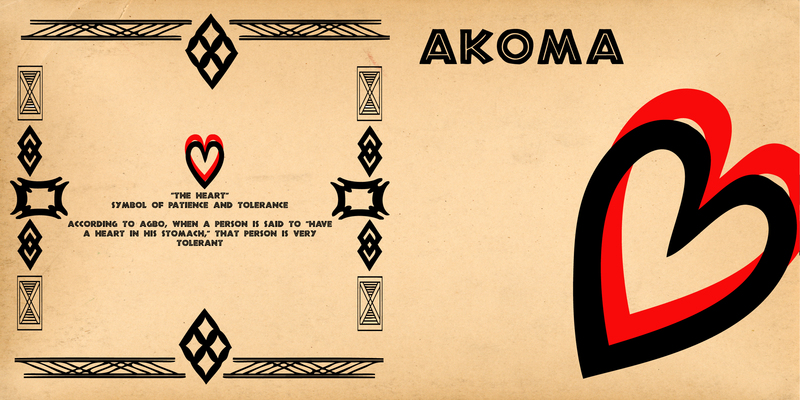 AKOKO NAN “the leg of a hen” – symbol of nurturing and discipline. The full name of this symbol translates to “The hen treads on her chicks, but she does not kill them.” This represents the ideal nature of parents, being both protective and corrective. An exhortation to nurture children, but a warning not to pamper them. ANANSE NTONTAN “spider’s web” – symbol of wisdom, creativity and the complexities of life. Ananse, the spider, is a well-known character in African folktales. ASASE YE DURU “the Earth has weight” – symbol of providence and the divinity of Mother Earth. This symbol represents the importance of the Earth in sustaining life. BESE SAKA “sack of cola nuts” – symbol of affluence, power, abundance, plenty, togetherness and unity. A widely-used cash crop, the cola nut played an important role in the economic life of Ghana. This symbol also represents the role of agriculture and trade in bringing peoples together. BI NKA BI “No one should bite the other” – symbol of peace and harmony. This symbol cautions against provocation and strife. The image is based on two fish biting each other tails. DENKYEM “crocodile”- symbol of adaptability. The crocodile lives in the water yet breathes the air, demonstrating an ability to adapt to circumstances. DWENNIMMEN “ram’s horns” – symbol of humility together with strength. The ram will fight fiercely against an adversary, but it also submits humbly to slaughter, emphasizing that even the strong need to be humble. EBAN “fence” – symbol of love, safety and security. The home to the Akan is a special place. A home which has a fence around it is considered to be an ideal residence. The fence symbolically separates and secures the family from the outside. Because of the security and the protection that a fence affords, the symbol is also associated with the security and safety one finds in love. ESE NE TEKREMA “the teeth and the tongue” – symbol of friendship and interdependence. The teeth and the tongue play interdependent roles in the mouth. They may come into conflict, but they need to work together. FIHANKRA “house/compound” – symbol of security and safety. Typical of Akan (Asante) architecture, the communal housing compound has only one entrance and exit. HYE WON HYE “that which does not burn” – symbol of imperishability and endurance. This symbol gets its meaning from traditional priests that were able to walk on fire without burning their feet, an inspiration to others to endure and overcome difficulties. KETE PA “good bed” – symbol of a good marriage. From the expression that a woman who has a good marriage is said to sleep on a good bed. MATE MASIE “What I hear, I keep” – symbol of wisdom, knowledge and prudence. The implied meaning of the phrase “mate masie” is “I understand”. Understanding means wisdom and knowledge, but it also represents the prudence of taking into consideration what another person has said. MMERE DANE “time changes” – symbol of change, life’s dynamics. MPATAPO “knot of pacification /reconciliation” – symbol of reconciliation, peacemaking and pacification. Mpatapo represents the bond or knot that binds parties in a dispute to a peaceful, harmonious reconciliation. It is a symbol of peacemaking after strife. NEA ONNIM NO SUA A, OHU “He who does not know can know from learning” – symbol of knowledge, life-long education and continued quest for knowledge. NSAA a type of hand-woven fabric. symbol of excellence, genuineness, authenticity. The nsaa symbols reflects a saying: “nea onnim nsaa oto n’ago”, which means “He who does not know authentic Nsaa will buy the fakes.” The quality of Nsaa has come to represent quality of workmanship in general. NSOROMMA “child of the heavens [stars]”- symbol of guardianship. A reminder that God is the father and watches over all people. NYAME NNWU NA MAWU “God never dies, therefore I cannot die” – symbol of God’s omnipresence and the perpetual existence of man’s spirit. This signifies the immortality of man’s soul, believed to be a part of God. Because the soul rests with God after death, it cannot die. NYAME YE OHENE “God is King” – symbol of the majesty and supremacy of God. NYAME BIRIBI WO SORO “God is in the heavens” – symbol of hope. A reminder that God’s dwelling place is in the heaven, where he can listen to all prayers. NYAME NTI “by God’s grace” – symbol of faith and trust in God.similar to Gye Nyame. This stalk is depicted as the staff of life in many cultures. It symbolizes to the Akan that food is a basis of life and that they could not survive if not for the food that God has placed here on Earth for their nourishment. OKODEE MMOWERE “the talons of the eagle” – symbol of strength, bravery, power. The eagle is the mightiest bird in the sky, and its strength is concentrated in its talons. 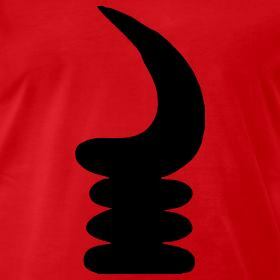 The Oyoko clan, one of the nine Akan clans, uses this symbol as their clan emblem. ONYANKOPON ADOM NTI BIRIBIARA BEYE YIE “By God’s grace, all will be well” – symbol of hope, providence, faith. OWO FORO ADOBE “snake climbing the raffia tree” – symbol of steadfastness, prudence and diligence. Because of its thorns, the raffia tree is a very dangerous challenge to the snake. His ability to climb it is a model of persistence and prudence. PEMPAMSIE “sew in readiness” – symbol of readiness, steadfastness, hardiness. The design of this symbol resembles the links of a chain, and implies strength through unity as well as the importance of being prepared. SESA WO SUBAN “Change or transform your character” – symbol of life transformation. This symbol combines two separate adinkra symbols, the “Morning Star” which can mean a new start to the day, placed inside the wheel, representing rotation or independent movement. WAWA ABA “seed of the wawa tree” – symbol of hardiness, toughness and perseverance. The seed of the wawa tree is extremely hard. In Akan culture, it is a symbol of someone who is strong and tough. It inspires the individual to persevere through hardship. WOFORO DUA PA A “when you climb a good tree” – symbol of support, cooperation and encouragement. From the expression “Woforo dua pa a, na yepia wo” meaning “When you climb a good tree, you are given a push”. More metaphorically, it means that when you work for a good cause, you will get support. Cloth as Metaphor: (re)reading the Adinkra cloth symbols of the Akan of Ghana by Dr. George F. Kojo Arthur. Great post! I love all these unique symbols. I don’t have any tattoos but if I did get one..it would be an adinkra symbol for sure! Thank you! I love the symbols and their deep Africa-centered wisdom. Thanks for sharing this informative and far-reaching presentation on Africa’s indigenous scripts, brother Saki Mafundikwa. Thanks Ana… also for helping to expand my knowledge. I wasn’t familiar with the Afaka script. Cheers! Greetings Nnabugo Gabriel. Would you care to clarify your point and/or question? It doesn’t seem directly related to this post on “Adinkra-Symbols of African Wisdom” …Thanks. Thank you for sharing this great information about African symbols. I love the powerful messages they tell. Are your symbols copyrighted? I would love to use two of them as a logo for an African American Genealogy group we are starting.